'LIZ KELLER' PAINTING IN OILS 'BREAKING DAWN' SEASCAPEMuted browns, black and gray. Signed by local NW artist. Purchased 2014 at the Seattle Design Center thru J. Garner Home. Original price was $1600. Picture of painting on artist website. Measures: 48" x 60". LOM001. 031619.$950.Email us about this piece. 'FLORENCE O'KEEFE' ORIGINAL OIL OF DUCKSGilded frame. Measures: 12"W x 10"H. HTT085. 030519.$240.Email us about this piece. 'T. JAMES' ORIGINAL OIL ON CANVAS OF SAILING SHIPSGilt wood frame with black velvet inset. Measures: 15"W x 13"H. HTT170. 030619.$310.Email us about this piece. 'LEO ADAMS' ORIGINAL PAINTING1994. Framed and matted. Measures: 59"W x 44"H. DOH002. 022819.$3500.Email us about this piece. 'ANN PRATT' 'A BOTANICAL STUDY'Tinted wood engravings, framed. Each measures: 20.5"W x 24.5"H. Set of 4. HTT167A-D. 030619.$1550. setEmail us about this piece. 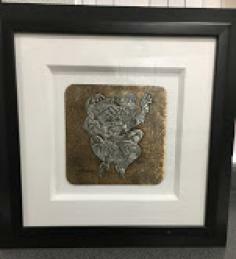 'DE KOONING' ORIGINAL LITHOGRAPHNumbered limited edition, 11/60, under glass with black and silver mats. Ornate silver leafed frame. * Measures: 37"W x 43"H. HTT179. 030619. *Slight wear on frame.$3000.Email us about this piece. 'GEORGE DOUGLAS BREWERTON' ORIGINAL PASTEL WATER LANDSCAPEIn ornate frame with pewter finish. Artist is George Douglas Brewerton, well known landscape artist. 1827-1901. Measures: 45"W x 32.5"H. BRB003. 020619.$2350.Email us about this piece. CHARMING ORIGINAL ART BIRDS AND BIRDCAGESIn gold frame, artist unknown. Measures: 35" x 35". FM005. 012219.$450.Email us about this piece. 'DAVID SMITH' ORIGINAL OIL LANDSCAPEON CANVASIn heavy gold frame. Well known artist. Purchased in Carmel for $10K. BRB002. 020619.$3750.Email us about this piece. VINTAGE OIL PAINTING OF THREE MUSES ON CANVASIn heavy antique gold frame. Artist signature not visible. Measures: 40" x 34.5"H. BRB001. 020619.$2495.Email us about this piece. 'DONALD FELS' LARGE ABSTRACT ARTTitled "Grecian Yearn" tempera with enamel framed under plexiglass. Measures: 50" x 52". MRP042. 011919.$700.Email us about this piece. 'LADY LUCK' SIGNED ILLEGIBLY 'MARY HEEBNER/1984'Collage under plexiglass frame (*frame has some damage at seams). Measures: 37" x 55". MRP002. 012919.$950.Email us about this piece. 'SEIKICHI TAKARA' LIMITED EDITION SERIGRAPHTitled 'Odyssey" ca. 1989 in black lacquer frame (*some chipping on lacquer). Measures: 3'8" x 4'2". MRP001. 012919.$910.Email us about this piece. VINTAGE ART CHARMING SEATED GIRL WITH DOVESUnder glass in vintage gold frame. Signed illegibly. Measures: 30"W x 38"H> BRB004. 020619.$810.Email us about this piece. 'GORDON CHANDLER' WALL ARTKimono Fashioned from barrel rusted finish. Measures: 33.5"W x 4"D x 61.75"H. MC023. 100218.$1850.Email us about this piece. 'ALOIS KALVODA' ORIGINAL OILNoted Czech landscape painter, 1875-91934. Winter scene of village with mountain backdrop in gold frame. Purchased in Prague in 2000. Measures: 30"W x 37"H. BB001. 080218. $595.Email us about this piece. VIENNESE BOOKPLATE LITHOGRAPH, PLATE 9Old bookplate, double matted and framed. Measures: 20.75" W x 28"H. DAG017. 052018.$160.Email us about this piece. ORIGINAL ART BY MOROCCAN ARTISTMay be acrylic, framed, 1998. Measures: 21"W x 25"H. DAG013. 052018.$110.Email us about this piece. SERENE WATER COLOR OF CHAIR AND TABLE BY BARBARA WARDMatted and framed, 1998. Measures: 32"W x 27"H. DAG020. 052018.$180.Email us about this piece. WATERCOLOR OF BOATS IN BLUE SEAMatted in blue with blonde frame. Purchased in Hvar, Croatia, 1998. Measures: 28.75"W x 21"H> DAG019. 052018.$210.Email us about this piece. 'AGRI CALLIGRAPHY' BY MARK ABRAMSONMatted and framed, ciba chrome, Ca. 1992. *Small crack in glass. Measures: 24"W x 19"H. DAG015. 052018.$110.Email us about this piece. 'SUE NASH, SIGNED, TITLED: OLIWALU NAVIGATOR IIKoa wood frame with glass. Offset lithography. Measures: 27"W x 35'H. DAG022. 060118.$195.Email us about this piece. CAD010A/B. 060218.$180. PairEmail us about this piece. MATTED AND FRAMED PIECE WITH ENCLOSED ANTIQUE BLUE AND WHITE BOWLSMeasures: 13"W X 26.5"H. KM010. 042818.$295.Email us about this piece. LARGE AMBER DECORATIVE PLATE ON STANDPurchased at Masins (2006). Measures: 25" in diameter. Stand is 21" x 6". TK001. 050218.$395.Email us about this piece. 'MARGARET MINNICK' HORSE ON SWIVEL STANDSigned. Appraised in 2018 at $1000-1500. Measures: 20"W x 6.5"D x 15.5"H. RE007. 042418.$850.Email us about this piece. LARGE ART PIECE FROM 'MASINS FURNITURE' WITH PEAR AND GOLD AND CREAMIn gold frame. Measures: 54"H x 41"W. LEM001. 041218.$695Email us about this piece. BLOWN GLASS ART BOWL, WHITE WITH REDIllegibly signed. #194. Measures: 19"W x 13.5"H. LM002. 011718.$300.Email us about this piece. 'ANATOLE KRASNYANSKY' 'RAPTURE' HAND HAMMERED RELIEFPewter on bronze. Signed in plate, lower left. From edition 150. See certificate of authenticity. Appraisal attached. Measures: 21.25" SQ. KH003. 010218.$1800.Email us about this piece. VINTAGE SMALL RED CHINESE SIGNMeasures: 9.75"W x 27.5"H. MW008. 112517.$250.Email us about this piece. 'STEPHEN TEDESCHI' ORIGINAL OIL PAINTINGFramed and matted. Measures: 25.75"W x 21.75"H. SQ051. 102717.$495Email us about this piece. "TETSURO SAWADA" SERIGRAPH 48/100Titled "Imprimus I." In black enamel frame with glass. Ca. 1986. Measures: 30.5" x 23.5"H. DH001102817.$395.00Email us about this piece. ORIGINAL OIL OF FISHERMAN IN CANOEGold frame. 41 3/4" x 29 1/2"H. ED002. 072817.$350.Email us about this piece.